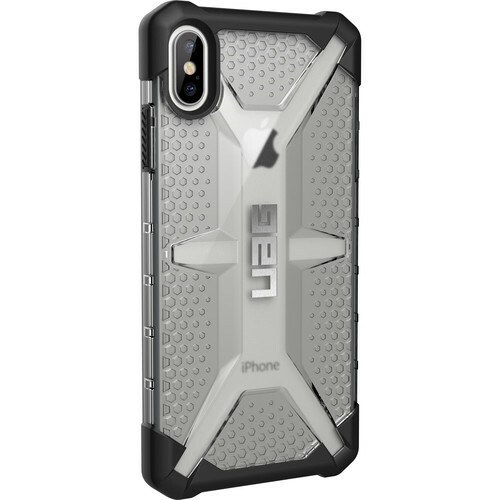 Keep your iPhone Xs Max protected from everyday damage with the ice Urban Armor Gear Plasma Series Case. This lightweight case features a hard armor shell and an impact-resistant soft core to protect your smartphone from bumps and nicks. This case has been tested to meet the U.S. Military's MIL-STD-810G 516.6 standard for protection against shock and drops. For added protection, this Plasma case has scratch-resistant skid pads on the rear and soft rubber surrounding your phone's screen. The rugged non-slip grip is intended to help you keep hold of your device while you're on the go. Additionally, this case is compatible with Apple Pay and wireless charging. A web of hollow cells provides rigidity and compression strength while minimizing size and weight. Exceeds military standards for drop and shock, enduring 26 drops, from 4' high. Unobstructed functionality of wireless charging and NFC payment systems.